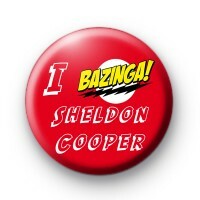 I Love (bazinga) Sheldon Cooper badge in red with the Bazinga lightning strike. The perfect Big bang theory inspired 25mm button badge. Perfect for fans of the show. We personally love the Big Bang Thoery here at Kool Badges & enjoy the escapades of Leonard Hofstadter, Sheldon Cooper, Howard Joel Wolowitz, Raj Koothrappali and of course Penny. Our favourite group of science geeks, scientists & astrophysicist's. These badges are also great for science teachers. Standard 25mm button badge hand made in our UK workshop. We have a great range of TV & Movie inspired badges so be sure to checkout the rest of the category.